Authorities are looking for three women seen on surveillance video attacking a male employee after he confronted them for allegedly trying to steal $87 worth of wigs from a shop in Queens late October. Wale Aliyu reports. 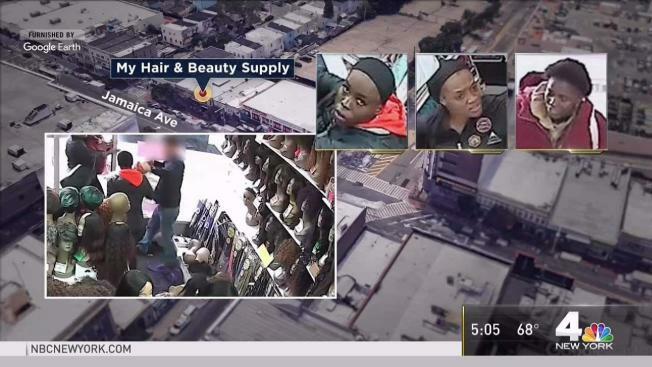 Authorities are looking for three women seen on surveillance video attacking a male employee after he confronted them for allegedly trying to steal $87 worth of wigs from a shop in Queens earlier this month. Police say the 57-year-old worker stopped the three women as they tried to leave the Hair and Beauty salon on Jamaica Avenue just before 3 p.m. Oct. 23. Once confronted, the women launched an all-out attack. Surveillance video shows the women punching the store employee; he falls back into a wig display and his glasses are knocked off. He gets up. Then two of the women, who had nearly been outside of the store, come all the way back in and begin wailing on him, whacking him in the face and pulling his clothes as one stands by the door, mouth agape. They then ran off. The victim refused medical attention at the scene. Anyone who recognizes the women seen in the above surveillance video is asked to call police.